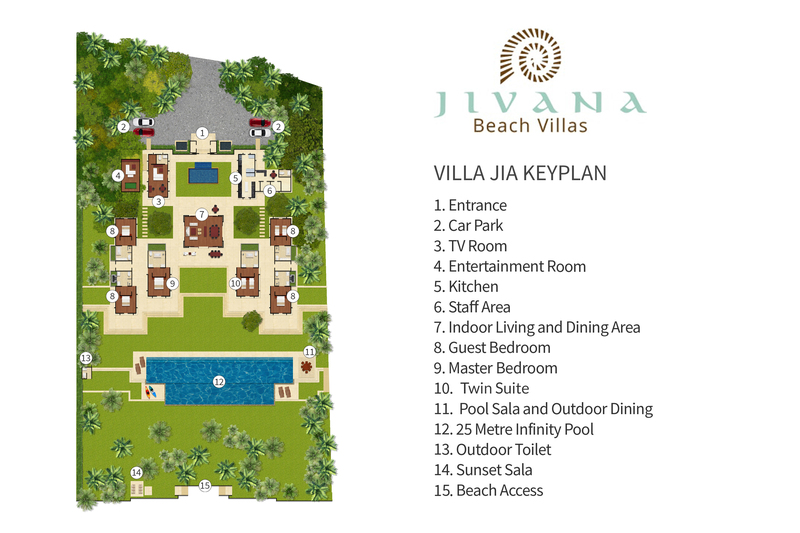 Villa Jia extends luxuriously over 6,400sqm of beachfront property on the pristine white sands of Natai Beach, just 25 minutes to the north of Phuket International Airport. The approach to Villa Jia is via a lush Thai landscape interspersed with captivating views of the Andaman Sea. The sheer enormity of the property becomes apparent when pulling into the private driveway, where welcoming staff await guests with warm smiles and cool refreshments. Once within the villa grounds, a granite water feature cascading into a reflective pool gilded with lily pads heightens one’s senses. The villa’s four open-plan contemporary Thai-style pavilions are connected by a series of walkways and corridors embellished with hand-carved wooden reliefs from northern Thailand. Between each pavilion are lush gardens and courtyards that glow an emerald green. An enormous lawn, ornamented with coconut palms, a 25-metre infinity pool, bar area and two salas, invites guests with the allure of romantic sunsets and candlelit alfresco dining. And with the endless azure of the Andaman Sea stretching out just beyond the lawn, the villa grounds make the perfect setting for an unforgettable wedding or other special celebration. Two pavilions house the villa’s six ensuite bedrooms, providing optimal comfort and privacy with easy access to the living spaces. Throughout are rich teakwood features and whitewashed walls accented with photographs depicting the region’s underwater wonders. Should the weather become ornery, guests will find sanctuary in the comfortable ‘Great Room’, or in the family room with its home cinema and games room below. A modern kitchen occupies a fourth pavilion, oozing the exotic aromas of Thai dishes prepared by Villa Jia’s professionally trained chef. A small army of villa attendants, under the charge of a knowledgeable manager, are on call and ready to serve, while 24-hour security ensures guests’ privacy and safety. The open-plan ‘Great Room’ rests at the centre of Villa Jia with bedroom pavilions on either side, mirroring each other in size. Opposite the kitchen, near the villa’s courtyard entrance, is a family room with downstairs home cinema and games room. To the front of the property is an expansive lawn with a 25-metre pool and two garden salas. Facing the swimming pool at the heart of the villa, with broad views of the Andaman Sea, is the lavishly designed ‘Great Room’ with comfortable lounge seating and dining for 12. This generously sized living space can be opened up on all slides with tall sliding glass doors, or enclosed and air-conditioned. The villa’s comfortable family room includes a small office area, library and service bar with wine fridge. Below is a gastro-pub-style home cinema and games room with snooker table, lounge seating and 47-inch plasma screen television with satellite channels, DVD player and sound system. On the opposite side of the courtyard is the immense, fully equipped kitchen. The bedroom pavilions and ‘Great Room’ share a broad veranda that joins with the pool deck. Here, guests can enjoy alfresco dining and poolside relaxation on one of the sun loungers. At one end of the pool is a bar area and a guest bathroom – ideal for entertaining and special events. Beyond the 25-metre infinity pool, which has a shallow section for children, is a vast lawn that stretches to the sand and is shaded by tall coconut palms. A poolside sala provides yet another alfresco dining option, while the beachfront relaxation sala is perfect for massage treatments and mid-day siestas. Gardens and courtyards lush with frangipani trees, native plants and flowers lie between the villa’s four pavilions, enhancing the tropical ambiance. All of Villa Jia’s elegant ensuite bedrooms are comfortably furnished with plush mattresses dressed in crisp white lines. Rich teakwood floors and ceilings contrast with whitewashed walls to create a relaxing ambiance. The rooms offer either garden or sea views and can be opened up with sliding glass doors to allow in the fresh sea air, or enclosed and air-conditioned. Each room is furnished with a teakwood writing desk and large wardrobe partitioning the sleeping area from the bathroom. The lavish sea view master suite is the perfect retreat for couples. It is furnished with a queen-size bed and equipped with a 32-inch flat-screen television with satellite channels, DVD player and iPod dock. The marble and terrazzo ensuite comes with a deep built-in soaking tub and an enclosed garden set behind a glass wall. Opposite, in a mirror-image pavilion is a second master suite with identical features to the first, but furnished with twin beds that can be converted to a king bed. Guest bedrooms two and three share the same view as their neighbouring suites, yet are slightly smaller in size. They are furnished with plush queen-size beds and equipped with 23-inch flat-screen televisions with satellite channels and DVD players. Their ensuite bathrooms are also similar to those of the suites, but have the extra luxury of large granite tubs set in private gardens. Guest bedrooms four and five are set to the rear of the bedroom pavilions overlooking private courtyards through sliding glass doors. One of the rooms is furnished with a comfortable queen-size bed and equipped with a 23-inch flat-screen television with satellite channels and a DVD player. The other offers twin beds that can be connected to form a super king bed. The ensuites are identical to those of the suites – including those deep built-in soaking tubs.